Part I: Common stuff about Search Driven Applications and first solution proposal with Office 365 / SharePoint Online. 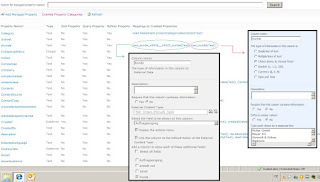 Pooling properties is no problem in a SharePoint on premise installation. But with Office 365 / SharePoint Online we ran in some problems. The main problem is that we cannot configure the Search Service Application in Office 365 / SharePoint Online. 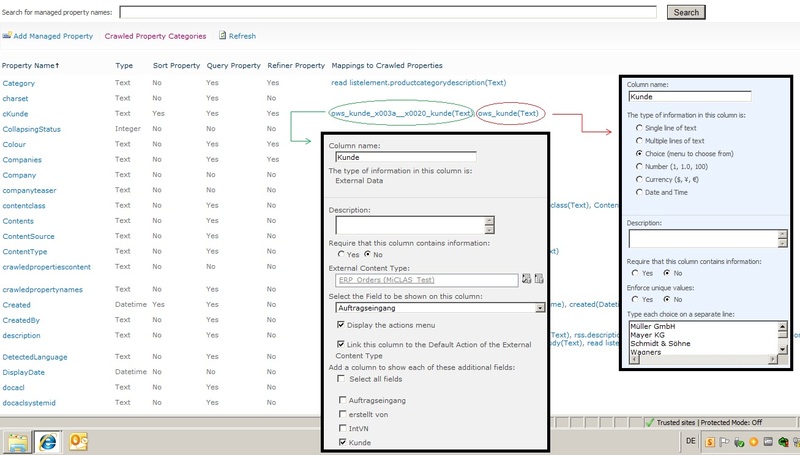 So we are not able to do the merge from Crawled to Managed Properties, and without Managed Properties we are not able to query the content for specific issues. We can of cause use the given default Managed Properties like “Author, Filetype, Name etc.” and build Search Driven Solutions based on them. The constrain here is that we cannot edit them free as we need. The Managed Property “Filetype” for example is filed by the system with the given value. So we have to use some “tricks” to build Search Driven Application with Office 365 / SharePoint Online. My solution for this problem is using the tagging feature in SharePoint 2010. Within this feature we are able to tag any content with special and individual information that can later be used to aggregate it under this scope or in the mix with other tags / scopes. Using the feature: “Metadata Publishing -> Save metadata on this list as social tags” allowed us to force users to fill in metadata in keyword fields or set default values which will then be automatically published as a social tag. 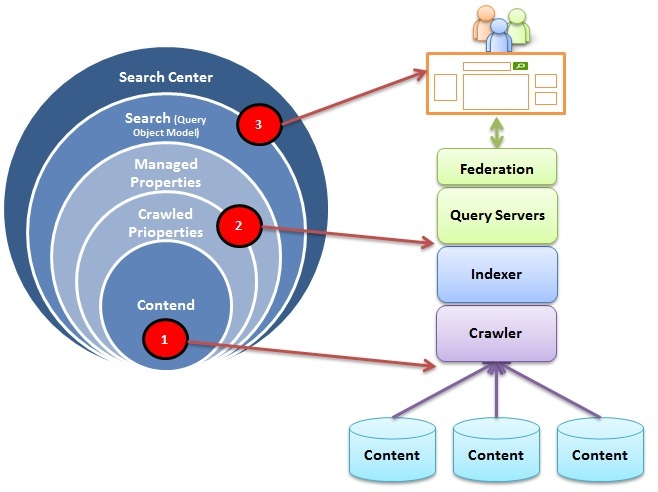 Based on this there are several ways to build Search Driven Solutions. During this Blogpost series I will come closer to two of them. There is a Crawled Property called SocialTagId that can now be used to query for a special tag and so it can be used to build a search driven webpart. This Managed Property can also be used with standard search syntax for building AND / OR queries and be mixed with other search terms. - The result is just the same you get when you navigate to the Tag Profile page for a special tag. Summary: we can build search driven solutions based on the tagging feature in Office 365 / SharePoint Online. Within advanced Document Library and List features like “Metadata Publishing” we can increase the usability and the user experience for adding this kind of information. 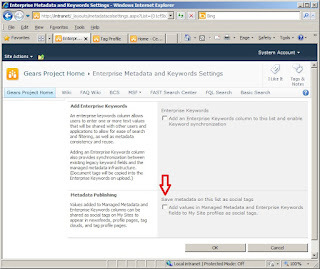 To aggregate any content tagged with special tags we can use the Managed Property SocialTagId. Next post I will show how we can aggregate content based on any different similar tags. Der Post basiert auf einer Frage aus der Community. Ich fand das wäre auch einen Blog Post wert. alles in allem funktioniert das also schon. Mit jQuery kann man da auch handanlegen. Das Problem bei all diesen Lösungen ist, dass die Sortierung im Client gemacht wird. Das kann, je nach Datenmenge, zu einer sehr schlechten Performance führen und belastet eben den Client. Wenn man solch eine Lösung als ein SharePoint Feature realisiert, dass dann auf dem AppServer läuft, hat man die Last vom Client zumindest schon mal auf einen skalierbaren Server verlegt. Der Punkt ist, dass das Resultset in beiden Fällen erst mal vom SQL Server geladen werden muss, dann umsortiert wird, und dann angezeigt wird. Die Lösung mit einem Feature ist natürlich schon mal besser zu skalieren als eine Lösung im Client. Die Tatsache, warum die Suche nur die beiden Sortieroptionen „Relevanz“ und „Datum“ anbietet hat natürlich ihren Grund. Die StoredProc proc_MSS_GetMultipleResults liefert das ganze SQL-seitig nach Relevanz sortiert (Details siehe hier: LINK). Eine nachträgliche Sortierung nach Datum ist einfach zu machen und kostet nicht viel Rechenzeit. Alles andere kann beliebig ausarten, vor allem bei größeren Datenmengen. …Der offizielle Weg wäre FAST zu nehmen und ein eignes Rankingprofil zu erstellen.